There are no subtle wah textures; the 440 is all about in-your-face filter goodness, with a host of intuitive, faithfully recreated tones. Rich, pronounced sweep. Filtered chord decays and dynamic fingerpicking sound great. Easy to use. For most players, envelope filters - and their groovy brethren, auto-wahs - will be forever associated with funk, thanks to their quacky snap, controlled using picking dynamics. 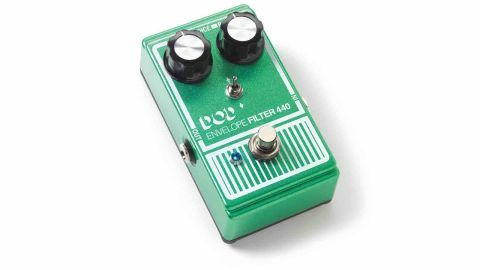 However, for players of all genres, the 440 is one of the most eagerly anticipated reissues in the DOD line, thanks largely to its use by Jonny Greenwood on live versions of Radiohead classics such as Paranoid Android. "It's hard to resist digging in for funky stabs, and the 440 has a rich, pronounced sweep"
For those not familiar with envelope filters, let's explain those controls: level adjusts the sensitivity of the envelope; the higher the sensitivity, the lower the signal required to activate the filter. Range controls the frequencies affected by the filter's movement; the further clockwise you go, the higher the frequencies swept. New for this reissue is a voice switch - in the up position, it delivers the classic 440 treble pop, but switching it down emphasises bass frequencies for keyboard- like tones. It's hard to resist digging in for funky stabs, and the 440 has a rich, pronounced sweep. Think outside the box, though, and you'll find plenty of other creative uses, such as utilising the level control to dial in filtered chord decays and dynamic fingerpicking.